There is NO "D" in LIQUI-FIRE because "D" stands for "D"angerous, "D"amaging, and "D"estructive products! #1 in the industry for decades because customers who used it are happy to recommend it. Please contact any of the stores in your area by clicking any of the links below then use their store locator. You can also print this "Retail Store Information Sheet" and take it to the store to ensure you get Liqui-Fire. 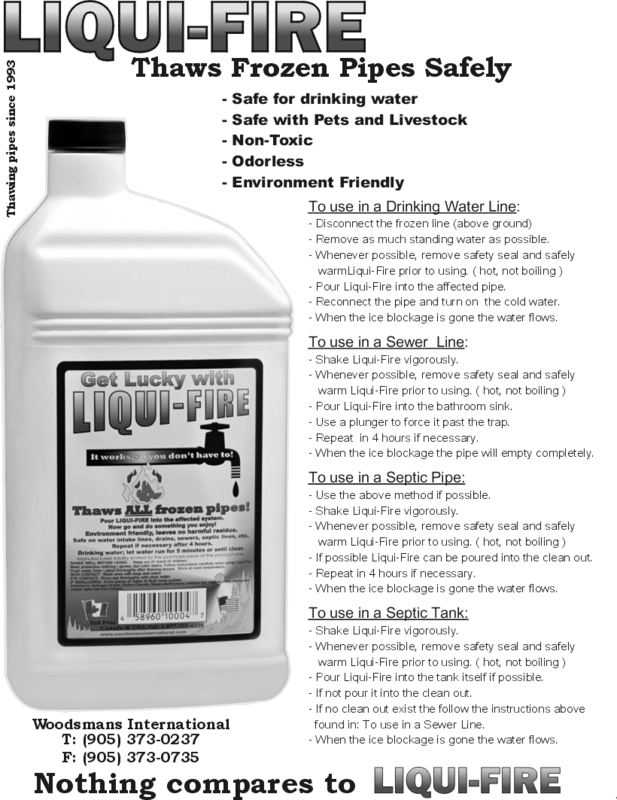 "Liqui-Fire Pipe Thaw" is available at most stores of the participating banners. You will not find Liqui-Fire Pipe Thaw listed if you are searching on a banner store's website. Banner store links are provided so that you can save tune to find a store's telephone number near you. BMR Stores - Home Hardware - Do-It-Best Stores - ACE Hardware - RONA - Castle - Hardware Hank Stores - Pro-Hardware -Timber Mart Stores - TrueValue USA CO-OP Stores - TrueValue Canada - and - many more. There are many other stores like Mercantile and Country Stores and Plumbing Supply Stores. We will NOT supply Canadian Tire: Click here to read why. Nous NE fournirons pas Canadian Tire: Cliquez ici pour lire pourquoi. Click on the blue text above or the image below for the Order Desk or Customer Service. Customer Service Order Desk . Copyright © 1993 - 01 Aug 2018 Woodsmans International All rights reserved. Droit d'auteur © 1993- 12 Juin 2011 Woodsmans International Tout droit réservé.